One of the most fundamental unexplained questions in modern science is how life began. Scientists generally believe that simple molecules present in early planetary environments were converted to more complex ones that could have helped jumpstart life by the input of energy from the environment. Scientists consider the early Earth was suffused with many kinds of energy, from the high temperatures produced by volcanoes to the ultraviolet radiation beamed down by the sun. One of the most classic studies of how organic compounds could have been made on the early Earth is the Miller-Urey experiment, which demonstrates how electrical discharges simulating lightning can help make a variety of organic compounds, including amino acids, which are the basic building blocks of all life. Another important source of energy in planetary environments is high-energy radiation, which has various sources including radioactive decay of naturally occurring chemical elements such as uranium and potassium. 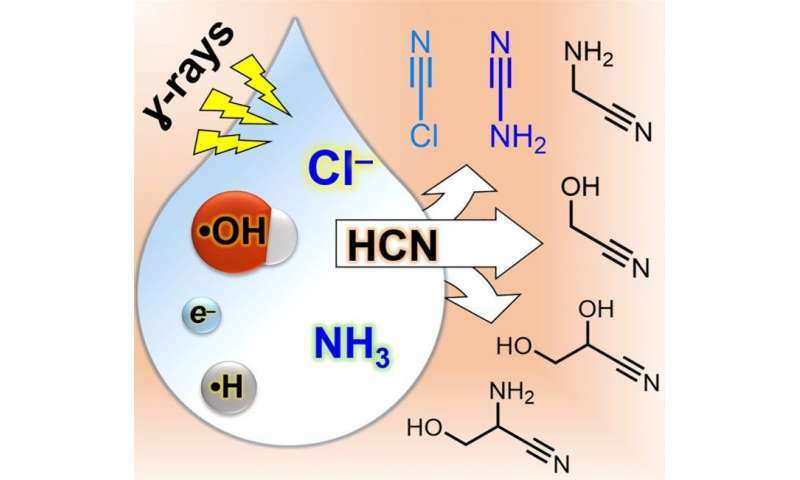 Research led by Yi Ruiqin and Albert Fahrenbach from the Earth-Life Science Institute (ELSI) at Tokyo Institute of Technology, Japan, has recently shown that a variety of compounds useful for the synthesis of RNA, are produced when simple compounds, combined with sodium chloride, are exposed to gamma rays.